Recycling the cardboard box is easy, but how do you responsibly recycle that old printer, DVD player or mobile phone? E-waste is one of the biggest challenges facing electronics consumers, and if you live in New York City, it’s illegal to just throw it out in the trash. While general recycling has become commonplace for consumers and businesses, electronic recycling is still in its relative infancy. There are also several important considerations for businesses. We've outlined both consumer and business options and considerations below. It’s important to remember that whichever path you choose, if your device has personal data on it, be sure to properly erase it before recycling or reselling. 1) Resell Online.The first (and likely most profitable) option is to resell your electronics on eBay or Amazon. eBay has a Global Shipping Program which makes it easy to sell your item(s) to overseas markets and all you do is list it and ship it to them if it sells. Amazon allows you to sell directly to the consumer, or to ship it to Amazon as part of their Fulfillment By Amazon (FBA) program. In either case, you’ll need to take good photos and be clear about the descriptions so buyers know what they are getting. 2) Trade In.Amazon has a trade-in program that will give you an Amazon gift card in exchange for trading in your device, electronics, video games and more. Gazelle also buys a variety of used items, and offers a quick payback. 3) In-Store Recycling.Best Buy has a nationwide recycling program for consumer e-waste, and is generally a free service, though it’s worth a quick call ahead as some states charge a small fee. They have a corporate goal of collecting 2 billion pounds of e-waste by 2020. Staples also offers a robust ink cartridge recycling program, as well as e-technology recycling. For good used devices, they can offer you store credit. Recycling electronics can be more difficult for small businesses and nonprofits who have stricter guidelines, are concerned about data security, would like to get fair market value for reusable electronics, or have more sophisticated electronics like servers to dispose of. The key is to plan ahead which means knowing your staffing needs ahead of time and matching that with hardware replacement cycles. Sinu provides a free Business Intelligence report for our customers called My Computer Replacement Plan to help gauge where technology is in its lifecycle. It is much better to be able to re-sell a laptop or mobile device while it is still in demand than to wait until the fair market value has dropped too low (and before it becomes a security risk). By timing your hardware replacement cycle properly, you can be recouping more of your costs while reducing your recycling needs. Another key consideration for commercial e-recycling relates to data security. It’s important to note that resetting your device to factory settings does not guarantee that the information has been completely erased from the device. It is essential in these cases to have someone knowledgeable and trusted manage the data erasing process. In some cases, you can find a company dedicated to e-recycling with the knowledge and expertise to erase data during the the device’s transition. At Sinu, we partner with 4th Bin, a company providing sustainable technology management solutions, including recycling and data destruction. Whomever you partner with, the key is to work with someone who understands the unique nature of e-recycling for businesses. Keep tabs on the fair market value of your electronics and plan to sell used ones when demand is still high. Use the sale of old equipment to offset the cost of new equipment and reduce your total cost of ownership. For printers, consider companies that give you discounts on future toner/ink if you recycle the cartridges. Have a plan for ensuring the device is wiped clean for data security purposes. Professionals can destroy your data and give you a Certificate of Data Destruction for added assurance. 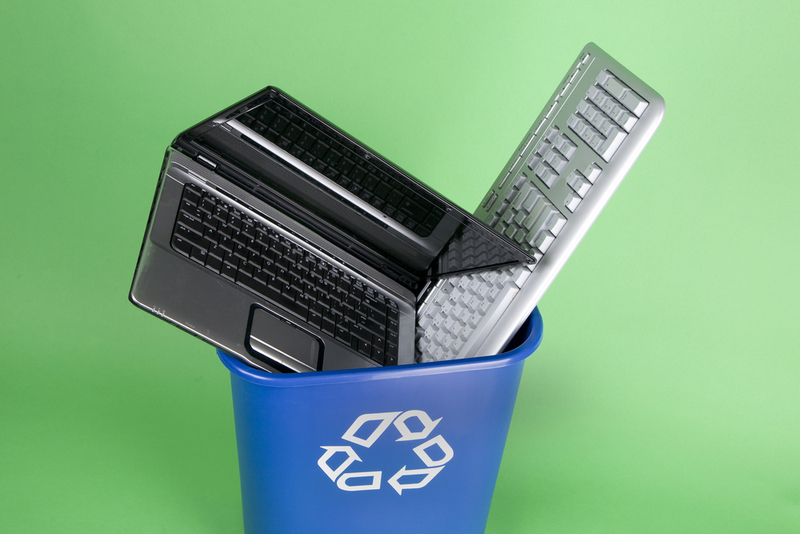 Having an e-recycling plan that includes properly disposing of electronics is not only better for the environment, but it can also be better for your bottom line while mitigating the risk of having sensitive data fall into the wrong hands.